As intelligent birds, parakeets -- sometimes also known as budgies -- can make fun and rewarding pets. However, they're all individuals with their own personalities and some may take longer to bond with their owners than others. If your bird doesn't bond with you right away, persevere and you'll end up with a feathered friend. Don't get upset if your parakeet won't bond with you at first, instead look at the situation from his perspective. You're much bigger than your bird and -- until he gets to know you -- you might seem a little bit scary. Imagine if a giant hand came through your front door and tried to grab you. More than likely you'd be terrified and wouldn't wait to see whether or not this strange giant was benign. You'll need to work slowly to build up a good level of trust between you and your parakeet. He needs to want to come to you, so never try to grab him from his cage. At first, don't actively try to interact with him, just talk to him in a slow and soothing voice when you're near his cage. Spend some time near his cage talking calmly or even simply reading or watching TV, but only put your hand in there when you need to change his food and water. Once your parakeet's used to your hand going in his cage to feed and water him, you can start taking a slightly more active approach. Try to get your bird to take a treat from your hand, they especially love millet spray treats, so this is a good reward to use. Once he'll take a treat from your hand, you can try to get him to step up onto your finger. Put your finger out like a perch and press very gently upward on his chest, near his feet. He should now hop onto your finger and you can bring him out of the cage with you. It may take several weeks of work until he's comfortable enough to sit on your finger. 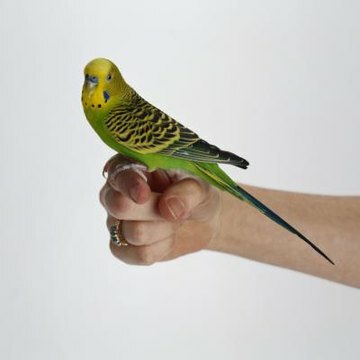 Once your bird will step up onto your finger, you can take him around the house and interact with him more. He may be happy to sit with you while watching TV or using the computer. It's important that you never push your feathered friend -- if he seems at all stressed out, return him to his cage. Train in short sessions of 10 to 15 minutes and always train using treats, praise and other forms of positive reinforcement. Never get angry with your bird if he's not responding the way you hoped. If you start to get frustrated, cut your training session short and try again in a few hours. Hand-reared birds are often quicker to bond than those reared by their parents, so you can expect to see slower results if your parakeet belongs to the latter group. Don't worry if you've rushed your parakeet in the past and he's become frightened of you. Just be around, speaking to him softly, without actively trying to interact with him. Let the bird show an interest, then take it slow as you forge trust. If you've tried all these methods and your parakeet still won't bond with you, it's worth taking a trip to a specialist avian veterinarian to check he has no medical issues. A parakeet in pain may be more fearful of you and reluctant to bond. As a last resort, try visiting a local pet behaviorist who has experience with birds.